Notes: In 1850 settlers that were located on the juncture of Dane, Iowa, Green and Lafayette Counties formed a church congregation. Worship services were held at the Torger Skartum farm. York church was organized in 1855 by 20 families. Construction of a church building was begun in 1861, but was delayed by the Civil War. The church was completed and dedicated in 1872. In 1880 a disagreement arose in the congregation and it split. One congregation faction purchased the existing building and the other built a new structure. These buildings became known as the “Old York” and the “New York.” Construction of this building began in 1884 and was completed in in 1885. A program to rebuild the church building began in 1948, with the exterior being covered with lannon stone and the addition of a new bell tower. 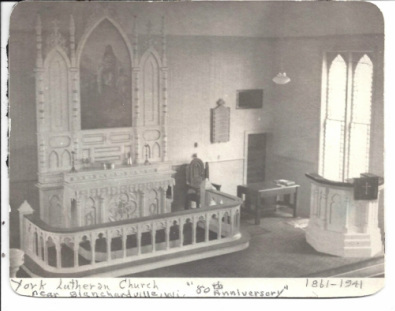 The interior was completely refurbished.In 1952 the name was officially changed from the York Evangelical Church to York Memorial Lutheran Church paying tribute to the pioneers who organized the congregation.